Once in a while, a potential client will ask us what type of camera gear we use. It is completely fair they are paying a pretty penny for their wedding photos, so they want to make sure their photographer has some serious gear. However, it must be said that an ultra-expensive camera does not guarantee ultra-spectacular photos. There have been times when we were shooting a wedding, and admiring guests, impressed by our professional-looking gear, commented, “That’s a nice camera…it must take good pictures.” (Sometimes it is actually a giant lens on the camera-body, and this is what the guest is referring to when they acknowledge the nice “camera.”) This has become an inside joke, because it is phrased as though anyone with a “nice camera” can take professional-grade images. Although onlookers surely do not intend for their statements to be off-putting, comments like this depreciate the photographer’s skill and experience. The gear is only a means to record an image, and of course it matters for your wedding photographer to use high-quality gear so that you get high-quality images. However, far more important than the gear is the photographer himself. Renowned photographer Chase Jarvis said, “The best camera is the one that’s with you.” No matter what kind of camera you give a professional photographer—be it one on an iPhone, a Polaroid, a crummy point-and-shoot, or the most expensive DSLR—they will create art because of their expertise in light, composition, and the inner workings of cameras. But, to answer your question, yes, we do have some nice cameras: Canon 5D Mark II, Canon 6D, and Fuji x100s. I’ll focus on the Canons in this post, as the Fuji is a whole other discussion. We’re primarily Canon users. Mark has favored Canon since he started shooting film in 2003. Their cameras are simple by design. Both the 5D Mark II and the 6D are full-frame, digital single-lens reflex cameras, or DSRL for short. The term full-frame refers to the size of the image sensor inside the camera. The image sensor is the piece inside a camera that records the image. The larger the image sensor, the larger the resolution of the photos. When digital cameras were first introduced in the early 1990s, the image sensors were much smaller, causing image quality to be very low. If you think back to the photos you took using a point-and-shoot digital camera when you were in high school, you will remember that the image quality was not top-notch. As time has progressed, sensors have grown, so now even consumer-grade cameras have larger sensors, allowing for higher-resolution images. 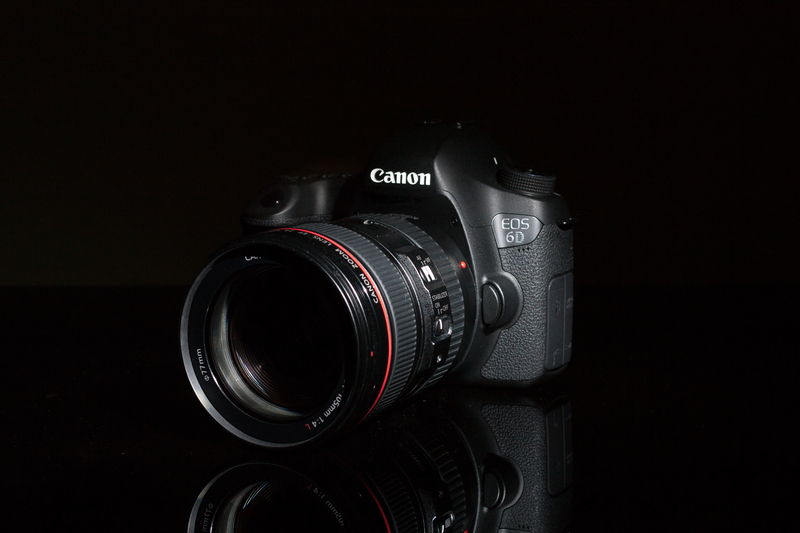 Another draw to the 5D Mark II and the 6D is the build quality. The exterior shells of these cameras are rugged, and it seems that they are built like tanks. We take great care of our equipment, but it’s comforting to know that the gear is built to be used and can endure the rigor of wedding season. Canon has been around since 1937, and they have proven—at least to us—that they produce superior cameras and lenses that last.